Constructed as a parador, or inn, about 1823, Casa del Rey, the "King's House," provided housing for Spanish government personnel. The building, the oldest in the town of Dorado, also served as the regional military headquarters. In 1848, Jacinto López purchased the structure; in converting it into a residence, he added two wings which created a U-shaped configuration around an interior patio. 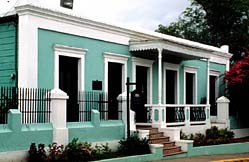 In 1871, Casa del Rey became the home of Manuel Alonso y Pacheco--Puerto Rico's notable romantic writer. Casa del Rey, restored and now a museum, is located at Calle Méndez Vigo #292 in Dorado, Puerto Rico. The museum is open 8:00am to 4:30pm, Monday-Friday. Call 787-796-1030 for further information.